1. I have had NDPH for 19 months. The headaches are ALWAYS in my right eye and the back of the right side of my head. Sometimes they’ll wrap around the right side of my head into my ear and neck. 2. They started November 25, 2013. Two days after I returned from a family vacation in Mexico. 3. After the headaches started, it took 18 months to get (what I think) is the correct diagnosis. Original diagnosis was greater occipital neuralgia, then cervicogenic headaches. 4. My pain level fluctuates but is always present. I used to one or two days off a month, but none for the last 6 months. 5. My typical pain level ranges from a rare 3 (if I’m lucky that day) to an 8. 6. In addition to pain, my symptoms include: Light and noise sensitivity, my eye feels as if it’s bulging out of my head, very painful throbbing (to my heart beat), and sharp stabbings. I have trouble ‘finding’ words when I speak. When I type, I mix words up and spell them wrong. Exhaustion. I am tired all the time. 9. When the pain gets bad, I retreat to my bedroom, close the curtains and sleep. For me, heat at least lifts the tightness in my neck and shoulders. Drugs do little to nothing so I only try them when I’m desperate. 10. The most frustrating part about having NDPH is: that it is very resistant to treatment. 11. Because of NDPH, I worry about: my husband and daughters. Also, my career or what’s left of it. 12. When I tell someone I have NDPH, the response is usually: Oh? Have you tried _____? Yes, yes I have. 13. When I see how little research and information exists on NDPH, I feel: Frustrated. Because it’s a fairly new classification so few people have heard of it and it’s hard to become educated in the diagnosis. 14. Having NDPH has affected my work life by: Forcing me to go on disability while I fought for my diagnosis and now appealing a gradual return to work while I have no income. It makes me so angry. 15. Having NDPH has affected by family life by: Creating a role reversal. My husband is now the cook, cleaner and nurturer because my headaches make me unable to assist most days. I miss our ‘normal’ family. 17. My best coping tools are: sleep, darkness, my heating pad and the patience of my family. 18. I find comfort in: my bed, and from my husband and children. 19. I get angry when people say: How’s your head? It’s the same answer every time and I get asked the question repeatedly by the same people. I realize they’re trying to be supportive but I’m tired of the pity or disbelief. 20. I like it when people say: Why don’t you just go lie down, I’ll take care of this. 21. Something kind someone has done for me in relation to NDPH is: My husband offering to rub my neck and make dinner (all the time). 22. The best thing a doctor has ever said to me about NDPH is: We have options. Don’t give up hope. 23. The hardest thing to accept about having NDPH is: Waking up each morning afraid of how bad the day will be. 24. Having NDPH has taught me: That I’m replaceable at work. It doesn’t matter how many years of heart and soul you put in, in the end you’re just a number and hey don’t care whether you in pain, you just need to get the job done or look elsewhere. 26. If I could go back to the early days of my diagnosis, I would tell myself: To start looking for answers sooner. Your body is telling you something is wrong. Don’t ignore the signs hoping it will just go away. 27. The people who support me most are: My husband, daughters and my parents. 28. The thing I most wish people understood about NDPH is: it’s not just a headache. It’s a headache every day, all day, of varying intensity. And as much as you say you empathize, you can’t possible understand what I’m going through. 29. Migraine and Headache Awareness Month is important to me because: I honestly had no idea there was such a thing until today. I’m so happy I found this forum and that I’m not alone. 30. One more thing I’d like to say about living with NDPH is: I am thankful for my amazing support system, and your health is the most important thing. Take care of yourself and don’t give up. 12. During a migraine attack, I worry most about: what is going on inside my head, how much it affects those I love. 13. When I think about migraine between attacks, I think: I’m glad I’m getting a break, no matter how small it is. 15. When someone tells me they have migraine, I think: I understand. 16. When I see commercials about migraine treatments, I think: I wish it worked, we need more advertisements about migraines themselves. 17. My best coping tools are: My mum, boyfriend, animals and Migraineur Misfits. 18. I find comfort in: knowing people who genuinely understand what I go through and knowing people who care. 21. Something kind someone can do for me during a migraine attack is: just be there for me (and bring me ice lollies!). 22. The best thing(s) a doctor has ever said to me about migraine is: I believe you. 23. The hardest thing to accept about having migraine is: that it is disabling and it’s not going away anytime soon. 24. Migraine has taught me: to look after my body. 27. The people who support me most are: My mum and my boyfriend. 28. The thing I most wish people understood about migraine is: It truly is life changing and we do not choose it. 29. Migraine and Headache Awareness Month is important to me because: It can save lives. 30. One more thing I’d like to say about life with migraine is: diagnosis is key. I was ignored when my migraines started so I ended up with chronic migraine from the start, I had a three year migraine/NDPH that broke upon my coeliac diagnosis then was two years into my second three year migraine before I got my diagnosis. By that point I was disabled by it and my life had fallen apart. Awareness is needed so people can get the RIGHT diagnosis. 30 Things About Matt’s Life with NDPH! 2. It started after: (Or just when it started if you didn’t have a precipitating event): It started 6-8 months after a concussion and my mother passing away. 3. After the headache started, it took ______ [weeks/months/years] to get a diagnosis. It took about 6 months after it started to get the first diagnosis of migraine. 6. In addition to pain, my symptoms include: My symptoms include nausea, memory problems, loss of vision in one eye or the other, sensitivity to light, odor, sound, being touched and speech problems/ coordination problems depending on severity of headache. 7. Treatments I have tried include: numerous medications, pain management, chriropractors, massage therapy, ice, heat, darkness, acupuncture, natural medicine. 8. I take ____ medications/supplements each day for prevention and ____ medications/supplements when the pain becomes unbearable: I take 3-4 OTC pain meds and 6-8 supplements a day. There doesn’t seem to be any prevention. Just dealing with the pain. 9. When the pain gets bad, I: I get an ice pack, take something for nausea, otc pain meds, try to sleep. 10. The most frustrating part about having NDPH is: That headaches are still a mystery and no on seems to have any answers. 11. Because of NDPH, I worry about: Family reactions, interaction, living. 14. Having NDPH has affected my work/school life by: Haven’t been able to work because of sensitivity to light, sound, smells, and coordination problems. 15. Having NDPH has affected by family life by: Can’t do family things, no family vacations, no family get togethers. 16. The one word that best describes my experience with NDPH is: Life-Changing! 17. My best coping tools are: My wife and daughter. 18. I find comfort in: Reading, watching tv. 19. I get angry when people say: you should be working, it’s just a headache. 20. I like it when people say: I have had bad headaches, I can’t imagine what you’re going through. 22. The best thing a doctor has ever said to me about NDPH is: We will find something that will help you. 23. The hardest thing to accept about having NDPH is: The headaches never stop. They ease off at times, but they never stop! 24. Having NDPH has taught me: Patience when interacting with others and dealing with my own feelings. 25. The quotation, motto, mantra, or scripture that helps me cope with NDPH is: The Day Will Come When All Things Are Better! This to shall pass! 26. If I could go back to the early days of my diagnosis, I would tell myself: Do more research, ask more questions, be prepared for all the looks and statements they uninformed people will make! 27. The people who support me most are: My Wife and Daughter! 28. The thing I most wish people understood about NDPH is: That NDPH and Migraines of all kinds are not just headaches!!! They are far more and far worse! 29. Migraine and Headache Awareness Month is important to me because: It helps get the word out and bring attention to the illness/disability! Far more people suffer from Migraines/NDPH than people realize. 30. One more thing I’d like to say about living with NDPH is: It teaches us how tough and strong we really are! 2. It started 6-8 months after a concussion and my mother passing away. 3. It took about 6 months after it started to get the first diagnosis of migraine. 4. My pain level fluctuates between a 4 and a 10. Most of the time it’s at the higher end of the scale. 6. My symptoms include nausea, memory problems, loss of vision in one eye or the other, sensitivity to light, odor, sound, being touched and speech problems/ coordination problems depending on severity of headache. 7. I have tried numerous medications, pain management, chriropractors, massage therapy, ice, heat, darkness, acupuncture, natural medicine. 8. I take 3-4 OTC pain meds and 6-8 supplements a day. There doesn’t seem to be any prevention. Just dealing with the pain. 9. I get an ice pack, take something for nausea, otc pain meds, try to sleep. 10. That headaches are still a mystery and no on seems to have any answers. 11. Family reactions, interaction, living. 14. Haven’t been able to work because of sensitivity to light, sound, smells, and coordination problems. 15. Can’t do family things, no family vacations, no family get togethers. 17. My wife and daughter. 19. you should be working, it’s just a headache. 20. I have had bad headaches, I can’t imagine what you’re going through. 22.We will find something that will help you. 23. The headaches never stop. They ease off at times, but they never stop! 24. Patience when interacting with others and dealing with my own feeling. 25. The Day Will Come When All Things Are Better! 26. Do more research, ask more questions, be prepared for all the looks and statements they uninformed people will make! 27. My Wife and Daughter! 28. That NDPH and Migraines of all kinds are not just headaches!!! They are far more and far worse! 29. It helps get the word out and bring attention to the illness/disability! Far more people suffer from Migraines/NDPH than people realize. 30. It teaches us how tough and strong we really are! What Are YOUR 30 Things About Living With Migraine or a Headache Disorder? This reader’s insistence on gaining something from migraine is a wise approach to retaining the upper hand. So often, refusing to give the upper hand is synonymous with barging through life as if in perfect health, which often leads to worsening symptoms. Instead, this reader recognizes the loss and limitation of having migraine, but also what can be learned and gained from it. It is wisdom I try to live by, though I’ve never described it so eloquently. Be sure to check the 30 Things Meme category and Twitter and Facebook for more insight from readers. To keep you from being overwhelmed by 10 times as many posts as usual, reader submissions are not going out by email, in RSS feeds, or on the homepage of The Daily Headache. I’ll be highlighting comments throughout Migraine and Headache Awareness Month, which starts June 1, but there’s no way I’ll be able to share them all with you. Will you share your 30 things? Here are the instructions and links to questions: Migraine and Headache Disorders 30 Things Meme. You can tell your story and remain anonymous, if you choose. (You need to put your name and email in the form to post, but I’m the only person who will see them and I won’t send you spam.) It’s a great chance for a short reflection on your life with a headache disorder. And, each story has it’s own URL, so you can send the link to friends and family, if you wish. P.S. 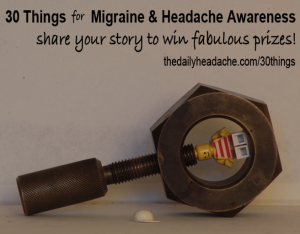 I’m putting together a contest from Migraine and Headache Awareness Month and will draw winners from 30 Things submissions. I’ll share details next week.